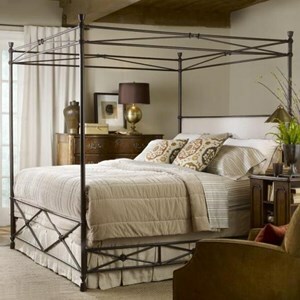 For a cozy and relaxed look, nothing says "home" like this charming canopy bed. The cast metal frame takes inspiration from farmhouse and rustic industrial styling in a dark, Antique Shop finish. An inset panel of upholstery in the headboard adds a casual vintage feel with a crisp, linen-blend fabric. This distinguished accent piece displays traditional European styling and a handsome, hand-rubbed finish on walnut burl. 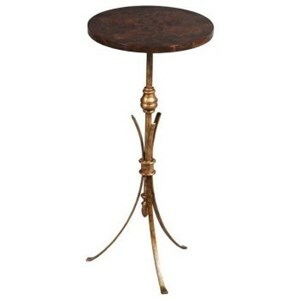 The base is shaped metal in complementing antique bronze finish. Create a cozy den with this spacious, curved sectional. Large plush seat and backrest cushions nestled with accent pillows create luxurious, plush seating perfect for relaxing during a movie or reading a book. Design details such as welt cord trim, set-back rolled armrests, and nailhead accents create a charming transitional style perfect for your elegant home. Finished with turned wood feet for sturdy, long-lasting support. 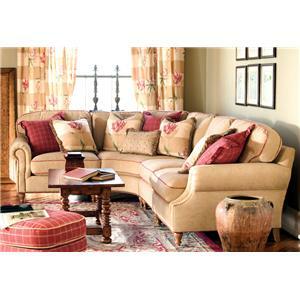 For 50 years, the Highland House name has been synonymous with fine, classic, traditional upholstery and case goods. Our stylish sofas, settees, loveseats, chairs and ottomans are renowned for impeccable tailoring as well as the finest fashion-forward fabrics and decorative trimmings. Highland House upholstery is more than just beautiful because we make comfort a priority through a range of comfort levels and values virtually unsurpassed in today's marketplace. Our European Excursion collections now include unique antique-inspired designs for bedrooms and dining rooms as well as occasional accents. Distinctive old-world finishes, unsurpassed comfort and classic European styling are our trademarks. Let Highland House be your source for stylish, easy-to-live with, designer-quality furniture. From formal-traditional to something a bit more casual, we have designs that will suit you, your home and your lifestyle.